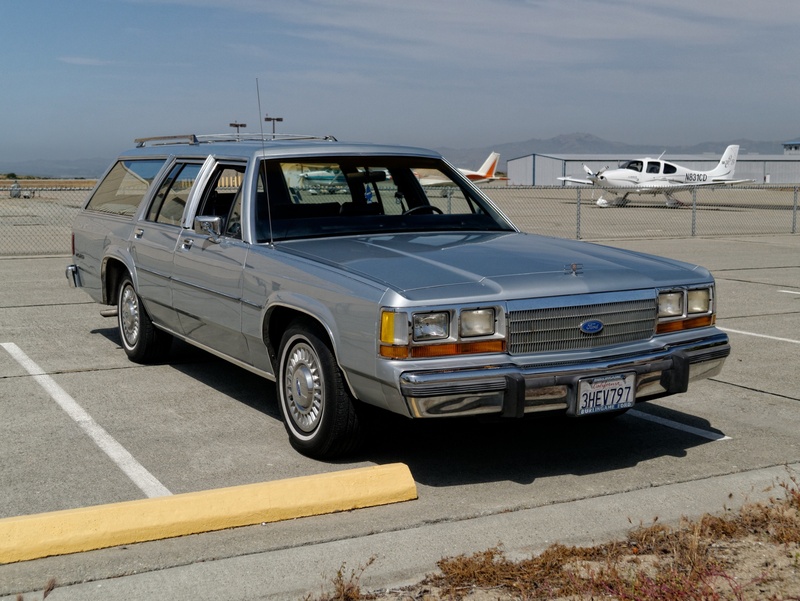 As evidenced by today’s earlier LTD Crown Victoria sedan, in the 1980s, there were still those who desired a full-size, no frills Ford sedan. For like-minded people who needed a bit more passenger and cargo space, they needn’t have worried. The Di-Noc-sided Country Squires tend to get all the attention, but during the Panther years Ford did offer a non-woodgrained plain LTD Crown Victoria wagon, for those who preferred a cleaner, simpler look. Going woodless didn’t mean forgoing power, as like all civilian LTD Crown Victorias, this wagon got the 5.0L V8 with electronic fuel injection. This one still looks rather elegant with its wire wheels, chrome trim, and paint stripes. The dark red vinyl interior contrasts nicely with the dark gray exterior. Its lack of Di-Noc siding has also helped it hold up much better with age, as most Panther-era Country Squires that are left these days have woodgrain that’s worn, faded, and peeling. Personally, I would ditch the whitewalls & hubcaps for some BF Goodrich T/As & dog dishes. Love clean wagons like these! It certainly needs bigger tires; those large wheel openings, especially in the back, look mighty airy. And of course those crappy Pep-Boys wires need to go. I almost positive those wire wheels are factory. They have the Crown Victoria center caps. I guess I’m the minority here but I actually like them and think they add touch of elegance to the car. But definitely agreed on the need for larger wheels. Those are certainly factory wire wheel covers. By 1986 most of these wagons were equipped with 15 inch wheels; my Dad’s 1982 had the rare oversized 225-75-14’s with the wire hubcaps. Even though they were 14’s the tires were big and filled in the wheel openings nicely. When you ordered the 15 inch wheels, you got 205-75-15 tires that were skinny and wimpy looking. Strangely enough, in 1982 you could order the Country Squire or LTD wagon with either 14 or 15 inch wheels, and the optional wire hubcaps came in either size, too. Glad my Dad’s had the oversized 14’s. They really looked good on that car. I remember him having trouble getting replacement tires as the car got older. That tire size was not common and was usually a special order from the manufacturer. Brendan; they are for sure. I left off the suffix “grade” after “Pep Boys”. And they are the worst wheel covers ever put on a car at the factory. It’s probably one of the main sources of my dislike of box Panthers; well that and the styling, the too-short wheelbase, little tires, almost universal half-vinyl roofs, etc…. Gotcha! Yeah they are pretty bad compared to other wire wheels of the era. The first gen Panthers weren’t the most graceful looking vehicles. Don’t forget the greenhouse design, with the recessed glass that makes it look like they intended to be used with storm windows. Elegant? no they look cheap and crappy real wires look elegant. They look more elegant than dog-dish hubcaps. They look awful, but they look *authentic*. I couldn’t imagine buying some unloved (but well-preserved) squaremobile like this car and then thinking you could make it better with some kewl wheelz. It was what it was. This was more-or-less my reaction. An ’80s Panther LTD with these wheel covers doesn’t so much look “bad” or “good” as much as “the way it’s supposed to look”. When I envision a Panther LTD from this era, I envision it with these wheel covers. I could be mistaken, but I believe the Mercury version had an optional 351 engine. In the early years you could get the 351 in both Ford and Mercury wagons. In fact at least in 79 it was required on wagons destined for CA. The 351 seized to be an option for civilian Panthers after 1980. It “ceased” to be an option. 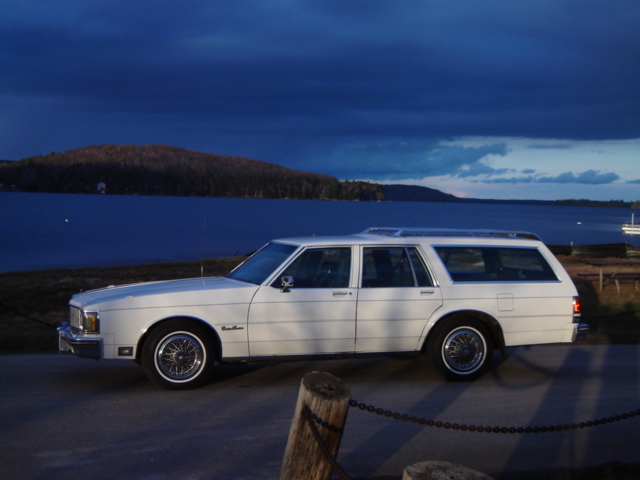 My 1979 LTD base (crank windows, no di-noc) wagon had a 351; it was really a fun car. The 351 was available in Canadian market cars after 1980, unlike the US cars. The 351 was offered in Canada at least thru ’87, and may have been in the 88-91 cars too. Strange fact, when AC became standard, it was possible to delete it, but you had to take the 351. I believe it was because the retail delete rate was very low, & the only deleters were cheapskate fleet customers like the RCMP, who were likely to also get the bigger engine. The RCMP resisted AC until the bitter end, when it was no possible to delete it. The first AC mountie cars on the prairies were ’89 Caprices. I don’t recall the last year for the 351 off the top of my head, but I know it was definitely available to the late 80’s like you said. It was part of the heavy duty trailer towing package. They weren’t very popular, at least around here most cars were 302 powered. By 1986 though I don’t know why you’d choose the 351 VV over the much better 302 MPFI unless your really needed the extra low end grunt. The 351 VV was available in Police vehicles until 1991 in both countries though, but by 1991 the 302 MPFI was pretty close in performance (except for top end). Correct, for civilian Panthers. P71 (police package) cars could get the 351 all the way up to 1991, though it didn’t make the jump into the aero generation. According to my copy of the Standard Catalog, the 351 continued to be available in U.S. civilian Fords and Mercurys in 1981, though oddly not in Lincolns. The text covering the Marquis states that in non-police models, it was only available with the trailer towing package. The LTD text doesn’t say that, but if it’s accurate for the Marquis, it’s probably true for the LTD as well. That might explain why the 351 wasn’t offered in Lincolns, if there was no towing package available in Lincolns, or if the 351/towing package combo was intended mainly for wagons (which Lincoln didn’t have). I never knew that the 351 continued in civilian Canadian models after 1981. I wonder why? Here’s what I had in my memory(which I know better than to trust anymore because it has stung me too many times)…after a certain year, ONLY the civilian Mercury and the police Ford had an optional 351 and it was carburetor only. I can’t remember anything about the Mercury option being station wagon specific. But then again, this is such a fuzzy memory it could be entirely incorrect. I cannot tell you where this came from. It was just a vague memory which I do not put too much trust in. I think this is a U.S. brochure — unless I’m missing something, I’m not seeing any indication that it’s Canadian. The equivalent section of the 1982 LTD brochure posted on that site makes no mention of the 351. Can you please make this again, powered by the 2.7 liter EcoBoost? Thank you. Buy a Flex. Same boxy styling, but with a 3.5 EcoBoost and all-wheel-drive. What you dont like the Fusion/Mondeo?. Try Ebay and do a RestoMod by fitting a current Ford engine. save the whale!. These things were prized by taxi companies serving LAX at the time for the huge luggage capacity. Today, its the not-so-mini van. Love this wagon – so rare without the woodgrain and it looks good, too! I have a special place in my heart for these as I learned to drive on my Dad’s 1982 Country Squire. It was remarkable how many people rode in that wagon and commented on how quiet, comfortable and luxurious it was. The Achilles heal for that car was the Variable Venturi carburetor. It’s as if the car knew it hit 70,000 miles and all hell broke loose. Dad kept it until well over 100k, and the carb was the only real issue he ever had with that car. He ended up trading it in for a 1988 Maxima (which he hated after the Lincolnesque ride you got from the Ford) In fact, if his Squire had the Electronic Fuel Injection I’m sure he would have driven that car for many more years until it died totally. Both Ford and Holley had emissions compliant new carbs to replace the VV. The Holley was in the $250 range and was a direct bolt on replacement with all of the proper connections. I wouldn’t mind owning this one myself! Its quite nice looking! We had one of these briefly when I was a kid. Ours was sort of a baby blue color. Pretty boring but you could fit a million people in the thing. I also had a soft spot for the wood-less wagons. In fact, I remember an inner voice telling me to go shopping late in the 1991 model year to see if any were still around. Then I convinced myself that a late model used one would be better. Then we started having kids and skipped straight to the Club Wagon. After all these years, I still HATE HATE HATE those fake wire wheel covers, which were the least attractive fake wires ever offered by any auto manufacturer anywhere in the history of the whole world. So there. I vote with Daniel up above on the dishes/trim rings/Goodrich white letter T/As. Maybe the Ford turbine wheels as a runner-up, or even the plain wheelcovers on the brown car from earlier today. Didn’t they still call these Country Sedan? Not sure. At least by 1985 all promotional material simply refers to them as “LTD Crown Victoria Wagon”. Not sure but I feel like the Country Sedan name died with when the Panthers came around. This one was photographed in the southern Massachusetts country town of Berkeley though. 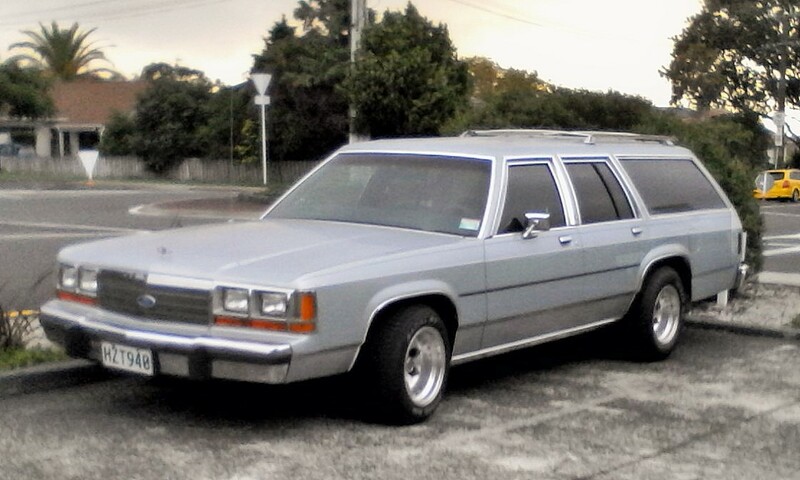 In 1982 with no woodgrain it was simply called the LTD wagon. If you look at the brochure, the Country Squire gave the customer some extra luxury touches like the addition of more woodgrain on the dash, rear door courtesy light switches, an electric clock, 18 ounce carpeting and seatbelt warning chimes to name a few. It was in 1983 that the non-woodgrained model (now called Crown Victoria wagon) got more luxurious. So as the years progressed, the non-woodgrain model lost a lot of its “stripped model” feeling. 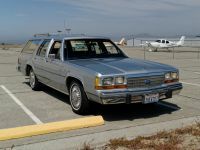 Also in 1983, the smaller Fairmont-based LTD was introduced, so to distinguish the models Ford had to beef up the full-sized models, and the Crown Victoria name was, for the first time, applied to the non-woodgrained wagon. Country Sedan was gone after 1974, along with it’s Galaxie 500 co-moniker. Replaced in ’75 by the LTD wagon. Yes that was the proper name for years but by ’86 it was called “LTD Crown Victoria Wagon”. The Country Sedan name was last used in 1972 while the low-end Ranch Wagon lasted through 1974. For 1975, you could get a LTD Wagon or a Country Squire. Both names last through 1974. The ’74 brochure shows the wagon lineup as LTD Country Squire, LTD Wagon, Galaxie 500 Country Sedan and Custom 500 Ranch Wagon. 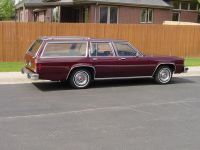 The 1975 lineup was reduced to the LTD Country Squire and LTD Wagon. Sorry JP but I disagree, I think those wire covers were very attractive! Yes! Someone else shares my opinion that they look good on this car! Put me down as a fan of these wire wheel covers. I have always been a wire fan, even though they can be a pain to maintain. I think they really add a sharp looking touch to an otherwise plain looking car. It makes for a very nice looking package that I would like to have in my driveway. The woodgrain versions also can look good, but when you have a color such as this one it is kind of a shame to cover half of it with woodgrain. Oh, I think they look good and that Paul is wrong. But he’s not my boss, so… I think there is a tendency (by me as well) that anything that looks like something old that we liked, but isn’t, is considered a cheap imitation. Which is true, I suppose, but lots of people love the look of wire wheels. But when was the last time you could buy a new car with actual wire wheels. The last I can think of is perhaps early 70’s MG’s? The “fake” ones maintained one likeness to the originals. They were hard to clean. I think real wire wheels were a factory option on the last of the boxy Cadillac Broughams (up to ’92). I could be wrong, but if I am, they’re a *very* popular aftermarket upgrade. I agree, the wire wheels go with the vehicle and are attractive and I don’t even like wire wheels. It’s not like you could replace them with Chrysler 5th Ave wire wheels (which could be argued as better looking, size discrepancies notwithstanding) and have it look au naturel. In a case like this, if I were to suddenly have that car given to me, I’d keep the whole look as-is and be fine with it. I figure with Ford’s access to resources and research development – even in the dark days when this design was developed – they might know a thing or two about cosmetic correctness. I do like the turbines but there are options. There is a light blue, non-dinoc Crown Vic wagon of this era that I see in traffic from time to time. It’s had the originial wheels replaced with a set of 17″ or so basketweave/mesh-style alloys–they work surprisingly well. 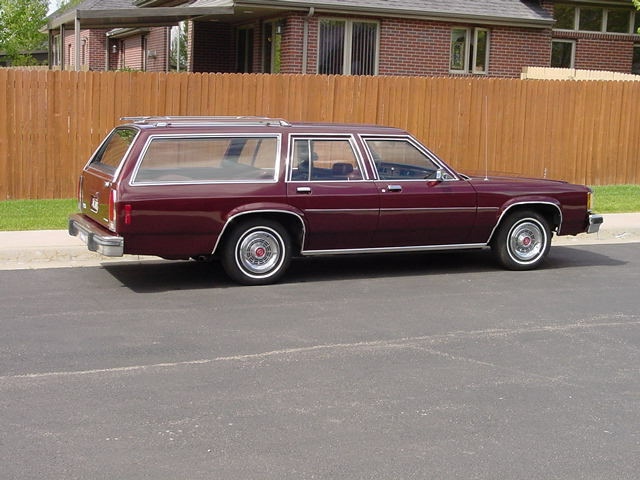 The people who live accross the street from my parents used to have a woodgrain-free maroon one, although it was the 88-91 version. At one point, someone who lived down the block wasn’t paying attention and managed to hit it with their 1st-gen Explorer as it was parked on the street. I think the Crown Vic got the better end of it – it was fixed, even though it had to be at least 10+ years old at the time. BF Goodrich T/As? There’s no accounting for taste. I ask myself, how could America ever fall out of love with the wagon segment? They are more popular than ever, they are just called CUVs now. Heck, even the bigger SUV’s are basically just station wagons in disguise. My wife’s daily driver for the past six years has been a Toyota Highlander; if that isn’t a (somewhat) taller Camry with a wagon body I don’t know what is. We certainly treat it as a wagon, taking it on vacations, hauling stuff in the back, whatever. It’s funny though; if I refer to the Highlander as a station wagon I get dirty looks from the wife. Apparently “wagon” has a connotation she is not happy with so “SUV” it is. Yep CUVs are just wagons on stilts, I had a play in a Ford Kuga yesterday nice to drive plenty of grunt from the 2.0 TDI engine but really a Mondeo on a ladder. There is one currently on ebay uk motors if you want to try the romance?. Looking quite spiffy there in the dark gray, well complemented by the dark red interior (though I’m not a fan of vinyl.) I’d also lose the fake wire covers, but dog dishes are too utilitarian – optional turbine alloys would work for me. Though “didn’t mean forgoing power” is correct technically, it’s debatable whether power is a proper adjective in any case–even with the benefit of FI, this particular variant of the 5.0 only made 150 HP. Torque helped make up for it, at 270 lb-ft.
Wow, looks incredibly well preserved. Base wagons usually never fared that well and were beat up pretty bad by the time Junior started driving it, then it went down hill even quicker. The higher trim ones didn’t seem to suffer quite as much abuse. It seems that either the wheelbase is too short, or the rear overhang is too long. Or it’s just me. Anyway, it is awesome. Really refreshing to see it without the stereotypical fake wood (which I usually have nothing against, though). The wheelbase in unquestionably short for the body, as it was on most cars of this era, but I think it’s the tiny wheels that give it a somewhat awkward “elephant in ballerina shoes” stance. Chevy’s B-Body had a 116″ wb; Ford went to 114″, probably to save a bit more weight. But the proportions on these box Panthers is atrocious, made worse by the inevitably too-small wheels for the giant wheel openings, and capped by the ridiculously bad wheel covers. Ugh. Somehow these look a lot better as Colony Parks. 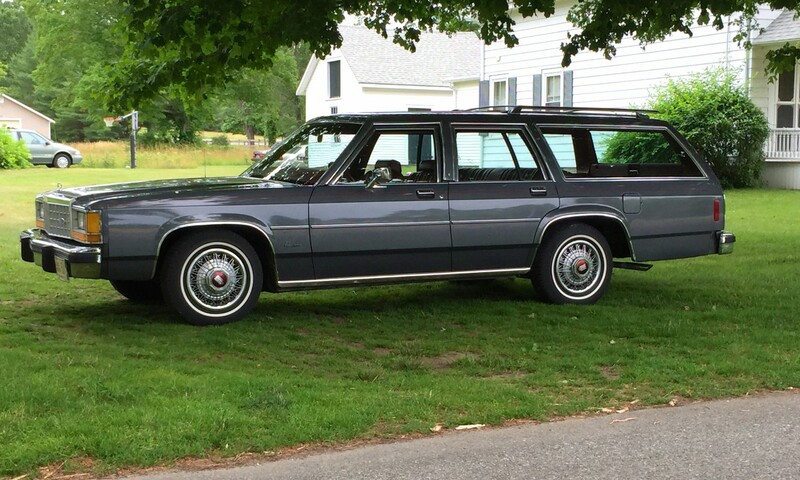 But GM’s B-Body wagons of the era just look so well-proportioned and handsome. I’d take them every time. I’ll take it just the way it is. The EFI was new that year compared to the previous years TBI. A hot rod IMO or at least my LTC was. I’ll take the wire wheels, luggage rack, whatever color etc. You keep the change. I guess I am in the minority actually liking these cars (and the wire wheel covers!!!) Perhaps my father owning one and me learning to drive with it helps. Lets face it, the overall quality of most American cars in the late 70’s – early 80’s was not too great. 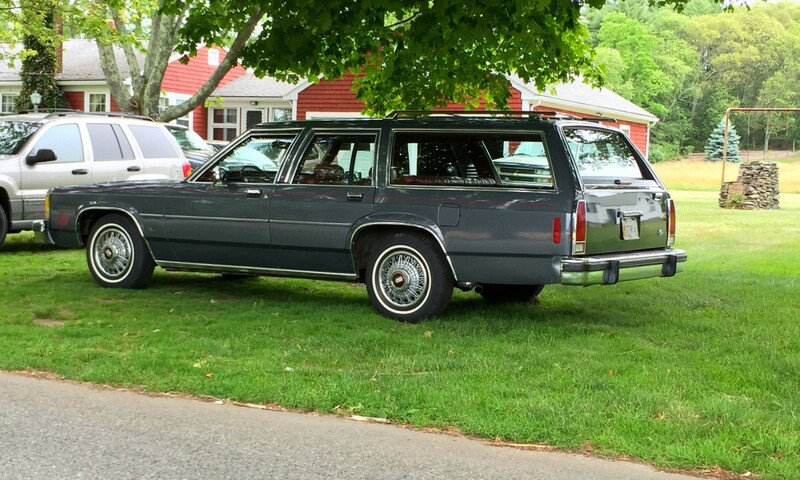 So our ’82 Country Squire that was actually screwed together beautifully, handled great for a large car, rode as smooth as silk and was very reliable was a pleasant surprise to my Dad. Those are the memories I have of that car, and probably the reason I am so fond of them even to this day. Nice photo of a nice car! Here’s my ’89, proudly sporting its optional vent windows … obviously I agree that Di-Noc-less is the way to go! Great looking car, with the best wheel (covers) they offered. It always amazed me how Ford pretty much defined and owned the wagon trade for so long. And how bad Chey botched it with the 1991 Caprice…. Please extrapolate on that last little nugget. Ford was the most popular wagon for many years, until the 1977 B-body wagons were introduced by GM. From that point on, Chevrolet beat Ford every year, and overall wagon sales GM beat out Ford by many units. This is probably part of the reason why GM continued with a wagon from 1991 onwards while Ford didn’t. I still want a ’73 or ’74 Mercury Colony Park wagon with a swapped in 7.3L Powerstroke in it. I’ve never been much of a fan of the wire wheel covers. Otherwise, what a nice wagon. There a couple of these running around here, including one that’s equally clean and Di-Noc-less. The sunny Southwest is a bit tough on woodgrain. My Dad was assigned company vehicles as needed. Typically, well loaded Oldsmoble Delta 88s. The company kept a plain Ford wagon like this for the building maintenance staff to run errands in. If all the 88s were out, they would assign the Ford to the Business Development guys like my dad. It was kind of cool to see an old school wagon at home – in the same brown from today’s color theme. Nice clean wagon, looks far better than Country Squire. I always preferred wagons sans woodgrain probably because that’s all we ever owned. My father owned a few wagons and absolutely refused to own one with woodgrain sides. He was convinced that it would hold moisture and cause rust (I think he was correct). The Ford wire wheels were awful looking. The GM ones looked nicer and were actually a pretty nicely made piece. That said, as they aged the spokes would loosen and creak at low speeds. I attached a pic of my last wagon, which was destroyed in a fire in 2009.
very beautiful wagon Bill ! Destroyed in a fire? How did that happen? The car was in the garage when the building caught fire. No fault of the car but it was completely destroyed. This is an older pic, but it still looked like that at the end of ’09 except I had replaced the wheel covers with a set of mid 1970’s Olds non-wire wheels covers (the original wheel covers were getting too creaky, but I still kept them as original parts). Sad, Bill….that car was rare too – you very rarely saw one equipped without woodgrain, yet with options like cornering lamps and fiber optic lamp monitors…..I bet it had the rare gauges too! Yes it had the option gauge cluster. It was a nice feature and my only B-body to have a full gauge set, although there were so small they were borderline useless. Still better than idiot lights alone though. I really liked the fiber optic light monitors, simple and effective way to monitor your lights. My family’s ’86 Parisienne had the GM versions of these wire wheel covers, and I agree, they’re just better-looking. More substantilal and more “real” looking. But the worst part of these Ford wire covers were the size of the metal “shield” behind the center caps–it’s unnecessarily huge, and makes them look cheap. In this colour, and with that roof rack it looks like a hearse. I might like it more in another colour. It actually was originally owned by funeral home for a few years, but was used a flower car. It had no Di-Noc, but it literally had every option except the towing equipment. I didn’t mind the white, I thought it made the car look a little more classy than a typical wagon from this era. It wouldn’t have been my first choice though, but the car was purchased due its immaculate condition. I am not a particular fan of the wire wheel covers, but it seems everyone wants to play “can you top this” in their comments about them. These were good, comfortable vehicles that provided plenty of cargo space, reasonable mileage and ease of driving, as well as interiors that were usually superior to those of other makers. Couldn’t have said it better myself, Larry (Although I like the wire wheel covers LOL) My family had several wagons over the course of many years, and our 1982 Country Squire was a great car all around – one of Dad’s and the family’s favorites. I would really like to have one of these big wagons. Not a fan of the wire wheel covers as they are a real chore to keep clean. Dog-dish hubcaps, then this thing would look great. Though I’d beef up the transmission a bit. I’m very fond of these Panther wagons; where I like the GM sedans better, these and the Colony Parks always seemed the classiest of the wagons. My 89. 15×10 Eagles, 235/60’s up front and 275’s in rear. Still only has 42k miles. I am so tired of the vogue huge tire and wheel packages that are so unnecessary and self-indulgent. I like the tire and wheel proportion of this wagon – it is a classic clean design that looks even better today than when new! It’s a beautiful car. I have driven GM B bodies and a few LTDs and the Fords handled better for me. The panther platform had a more formal look. My 1982 wagon could be driven off a curb and it would barely be felt. Yes, the Buicks and Oldsmobile wagons/sedans did look nice, but it’s a matter of preference. Some feel that Ford copied Chevy when it downsized in 1979. There are only so many ways one could design a downsized American car in the later part of the 1970s. Chrysler had downsized also if any one remembers the Dodge St. Regis. That was a box. I wished Ford had not sold most sedans with the partial vinyl roof treatment, but it’s ok.